Today we are off to Leipzig for the latest image in our tour of tramways from around the world. 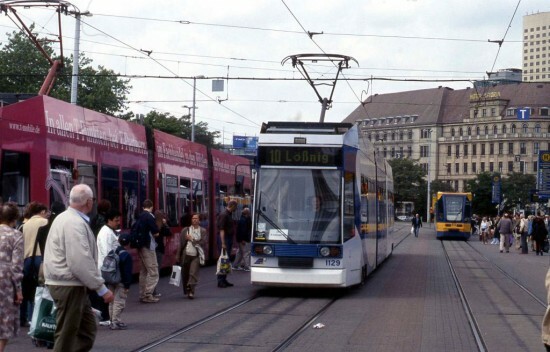 Leipzig in Germany has had a tramway since 1872 which now consists of 92.1 miles which makes it the second largest in Germany (only Berlin beats it). The gauge of the network is 1,458mm. The tram we see in this shot is 1129 which was built by Duewag as part of a batch constructed between 1994 and 1998. It is at the busy stop outside the main railway station with a route 10 service to Lossnig. The date is 23rd May 2003.